So what does all this mean for the grower? The answers go back thousands of years, back to the beginnings of life on earth. Whenever a seed sprouts or a seedling is planted, the microbial community which helps the plant grow is being activated. Via exudation the plants release chemical signals into the soil which trigger a myriad of activities. Genetic information is being exchanged and different “microbial players” position themselves on the tissues of the plants. In many cases microorganism cooperate among themselves in order to provide their “service” to the plant. Learn more about our microbe combination. So what does all this mean for the grower? The answers go back thousands of years, back to the beginnings of life on earth. Whenever a seed sprouts or a seedling is planted, the microbial community which helps the plant grow is being activated. Via exudation the plants release chemical signals into the soil which trigger a myriad of activities. Genetic information is being exchanged and different “microbial players” position themselves on the tissues of the plants. In many cases microorganism cooperate among themselves in order to provide their “service” to the plant. Our family of microbes digest and mineralize your farm’s carbon matter and other nutritional inputs, including dead carbon matter. The broken-down carbon, humates and fulvates act as a ferryboat, transporting minerals into the root structure. These same ferryboats also help bind heavy metals, thereby keeping them from entering the plant. Our fungi act as a barrier, preventing nematodes from feasting on your crop’s soil structure. 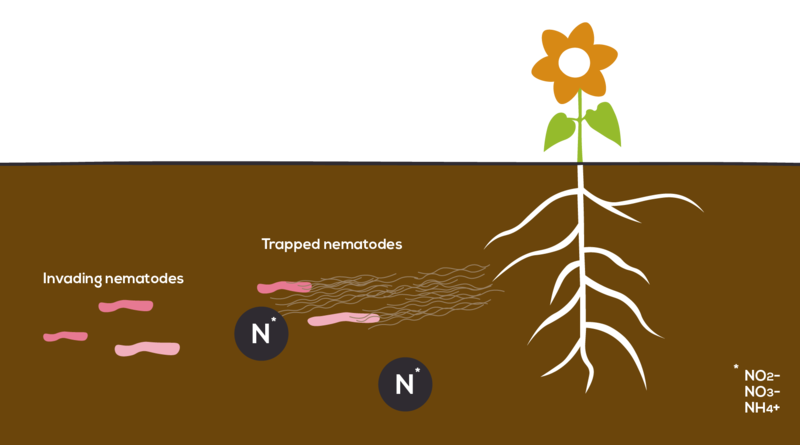 In fact, fungi trap and consume invading nematodes, thus releasing more nitrogen into your crop’s soil. Our mycorrhizae and fungi both have thin and fast-growing roots called hyphae. ProVeganix hyphae act like a sponge that retains water and clumps, meaning that the structure prevents secure soil from being washed away. The hyphae grow vertically as well as horizontally and interconnect your soil, building a nutrient distribution system. The network solubilizes phosphorus, sugar and other molecules and delivers them to your crop’s root hairs. Phosphorus does not leach – but even a distance of 1 mm from a root is too far for the root hair to grab it. Hyphae build networks that can take hold of these nutrients and help deliver them to your root system. ProVeganix creates robust plant and soil structures, making them water-retentive. While our carbon particles, clumps and humates retain water due to their polarized structures, our fungi and mycorrhizae store moisture by making the soil sponge-like. In addition, if the top soil is moist the exchange of ions and minerals continues. Through microbial activity, we help aerate the soil. Over time, this aeration expands further into the soil, enabling the roots to grow deeper and deeper. (The longer it is used, the deeper crops grow). Your crop’s roots are stimulated to grow in length and increase in volume, due to healthy levels of rhizobial bacteria, fungi and through use of recommended cover crops. In the aboveground plant structures, vitality is increased by opening the stomata for gas exchange and by triggering the production of auxin, cytokinin, jasmonic acid, ethylene, salicylic acid and other enzymes. Some of these enzymes attract the enemies of pest insects: beneficial insects – your friends. This chemical communication fortifies the overall immune system of your crops. When our foliar product is applied, the natural microbes act as a defensive shield similar to the lactobacillus in the human digestive system. Our product is a prebiotic in the soil and a probiotic on the surface. The result of this biotic system is a phenomenon known as competitive exclusion. The most impactful fungi and bacteria are the ones that are natural to the soil, grow quickly and require the same things that a plant excretes. Under such ideal conditions, the beneficial microbes act as a shield so that new microscopic invaders such as blight, fusarium, canker, blackspot and citrus greening disease cannot enter the plants. Our product contains microbes that can absorb carbon from the air and bring it to earth. Bacteria also break down lignin and cellulose from foliage (leaf waste) into smaller carbon particles that are soluble in water. ProVeganix hyphae act like sponges that retain water and are responsible for clumping. Their structure secures the soil from being washed away. Hyphae put phosphorus, sugar and other molecules in a solution and deliver them to your crops’ root hairs. Fulvic acid and humic acid are naturally occurring molecules. They have several negatively charged pockets, which enable cations to attach themselves and be delivered into the crop system. Our microbes ensure the organic chemical balance among these microsystems. Our microbes (fungi, mycorrhizae and bacteria) increase CEC within your soil samples and ensure the organic chemical exchange of anions and cations among the various living organisms that constitute your topsoil’s microbiome and microsystems. Some of our microbes remove nitrogen from the atmosphere – making it available to the plant. As an essential component of a comprehensive plant nutrition program, our product provides fruit and vegetable growers with a higher brix to acid ratio and leads to sweeter and better tasting fruits. If you need to store your products in silos, there will be less chance of silo-related diseases such as fusarium. Your fruits and vegetables will be more resistant and more durable for the shipment to your markets.